An incident that happened the weekend of July 4th 2012 sparked a community-wide conversation that led to the awareness of the need for a new shelter. ​During those years, and in the years since, many stories have been aired on the area news stations, in print, and online. To most Marshall citizens, the need is apparent, as it has been to all of the many animal shelter experts and consultants who have visited our shelter over the last several years. As part of our research, we contacted randomly selected shelters from around the state in comparably sized communities (Marshall’s shelter serves the county too, so we selected 20,000 to 100,00 as a fair population comparison range) and we asked them for a number of metrics that would be helpful in evaluating our situation. You can see the results of that survey on the chart at the bottom of this page. ​This process began on July 9, 2012 when my wife posted the attached story. ​Note: The tone of this story points a finger at the city employees who worked at the shelter. Within a couple of days, it became clear that the problem was not the employees; it was the facility they were forced to work in. ​This is a tale of how a dog came within hours of starting a new life with food, medical attention and love only to be killed, thrown into a dumpster and tossed in a landfill. And why did this happen? Because someone at the Marshall City Animal Shelter felt it was more important to start the day killing dogs than checking telephone messages. ​Elaine and Chris Slaughter first heard about the white, sickly boxer (whom they named Mercy) when a relative went to the animal shelter on July 3 and saw the dog. Knowing the Slaughters love white boxers, she called them. Unfortunately, it was now after 5 pm, but Chris and Elaine went to the shelter (actually they made two visits) and saw that the dog needed medical care and food. They left numerous messages on the phone saying they knew the dog needed care, etc., but they wanted the dog in any case and would be willing to make any investment necessary to make its final days (if it came to that) happy. ​July 4 was a holiday, and Elaine made several visits to visit Mercy. On July 5, Elaine started calling at 8:06 AM. She made numerous calls, and someone answered her 11 AM call. She inquired about the boxer and was told a rescue league had picked her up, but he could not tell her what rescue league. 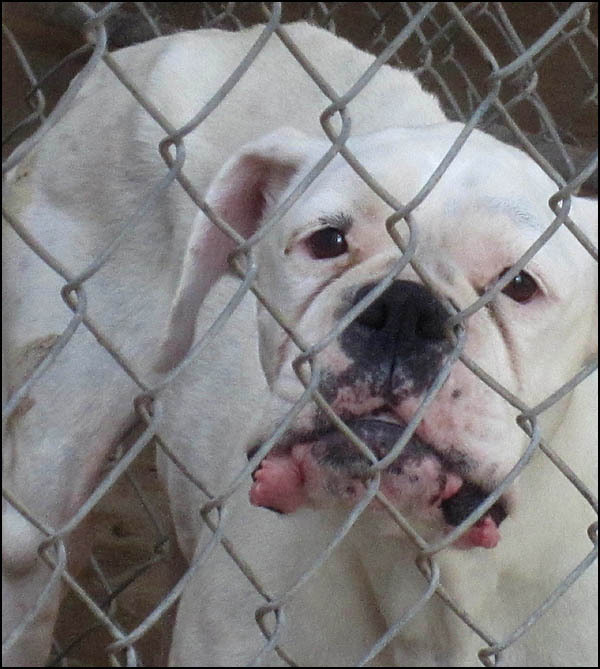 At 1:30 Elaine went to the shelter, and the cage that the boxer had occupied contained a different dog. Once again, she asked for the rescue group’s phone number. A lady at the shelter told Elaine to write down her name, phone number, and address, and she would try to have the rescue group that had taken the boxer call her. ​At this point, the Slaughters went into overdrive in a last ditch effort to try to save Mercy. Mercy must be alive because the animal shelter lady had asked Elaine for her information, and of course, she had the information from the numerous phone calls Elaine had been making since Tuesday evening. The answer to this was simple—find out what rescue league picked up Mercy. ​Elaine contacted Kay Hill at the Pet Place in Marshall. Ms Hill could not obtain any additional information. ​Truly believing that the boxer had been picked up by a rescue league the Slaughters went on the Internet and contacted every rescue league possible, looking for a white sickly boxer who had been picked up in Marshall on July 5. Six people from rescue groups called her to tell her they had been unable to locate Mercy. On Friday afternoon, July 6, Elaine called upon the Marshall City Police Chief. She explained the situation, stating they had been calling and visiting the animal shelter since July 3. If they could obtain the telephone number of the rescue league who picked up Mercy they would drive to wherever, pick up the dog and take her to a veterinarian so that Mercy would have a comfortable weekend. ​The Chief made one call and had the answer in a few seconds. Mercy was killed and carted off in dumpster where she was taken to a landfill. ​Thinking the dumpster may not have visited the animal shelter yet the Slaughters called the animal shelter and asked if they could come and retrieve her remains so that she could be buried in a pretty place on their property and receive love and care even though she was dead. They were told the dumpster had come and gone. When asked why they were lied to and led to believe she was with a rescue group the animal shelter man said he was going to be the bad guy in any case. ​Granted the shelter has to put down animals but this one didn’t have to be killed. Mercy could have had a few good meals, a comfortable bed and lots of love in her final days IF only someone had taken the time to listen to their voice mail before they started killing the animals. A framed photo of Mercy now resides on the Slaughter’s mantle. Even though she is gone she was loved. Independence Day is July 4th. It’s the anniversary of our country’s declaration of freedom. This year, it’s another anniversary as well. One year ago, that same day, a dog named Mercy was euthanized at the city shelter. Someone had wanted to adopt her, but she wasn’t well, and the shelter staff put her down without knowing she was wanted. This caused an outcry, inspired by an article published in East Texas Towns by Deloris Munden. ​This seems like a tragic situation, but as is often the case, in many ways it turned out to be a blessing. It shone light on the difficult situation at the Marshall Animal Shelter: an outdated building, a small overburdened staff, lack of space, lack of funds, and not enough volunteers. ​Elaine Slaughter, who had hoped to adopt Mercy, instead of being angry or bitter, proposed that we work with and support the shelter staff. She and Shelly Cullum, the shelter director, traveled to a conference to learn ways to lower kill rates. We began holding adoption events at Second Saturdays and local festivals. The Facebook page was updated. Ron Munden and I started photographing the animals and putting the photos online. A new larger sign, was donated by Mayor Ed Smith and generously installed free of charge by Gary Closkey of Closkey Construction. Adoptions have increased. Many people worked together to make good things happen, but we can only do so much with what we have. ​What we have is a building that is 44 years old. The Marshall Animal Shelter was conceived and built by a small group of dedicated Marshallites led by Gloria Snyder, who in 1967 decided that Marshall needed a shelter. There was none at the time, just a fenced in area with cages where all the cats and dogs were kept together. She put an article in the paper asking for support and calling a meeting. By 1968, the shelter was being built. This was an incredible accomplishment in a short amount of time. One that can serve as inspiration for us today. ​Marshall’s animal population has grown in ways that no one at the time could have anticipated. Our community would benefit greatly by having a new shelter with more space. The existing building is not capable of being renovated or enlarged to meet today’s needs. The memory of Mercy and the fine example set by Gloria Snyder can help to spur us forward. ​The situation is complex. Currently three out of four animals that enter the shelter never make it out alive. In many cities, those numbers are reversed. The solution is simple. A new building with more kennel space, a medical room where veterinarians can come in for spay/neuter clinics. A warm and inviting lobby, with an area for potential owners to meet and get to know the animals, would help get our adoption numbers up and euthanasia rates down. It would put Marshall on track with what most other cities are doing, making their community better for both animals and people. A new facility would give our dedicated shelter staff the opportunity to serve our community in ways that they cannot with our outdated facility. ​A year has gone by since Mercy left this world. Let’s make this year one where we move toward a better future for Marshall’s people and pets. Please contact me if you are interested in being part of this effort.